Today am going to introduce you to one more new brand. I have very sensitive skin and hence get tanned easily even if I am out in the sun for 5 minutes. Though sunscreens help a bit, but not entirely to prevent tan. 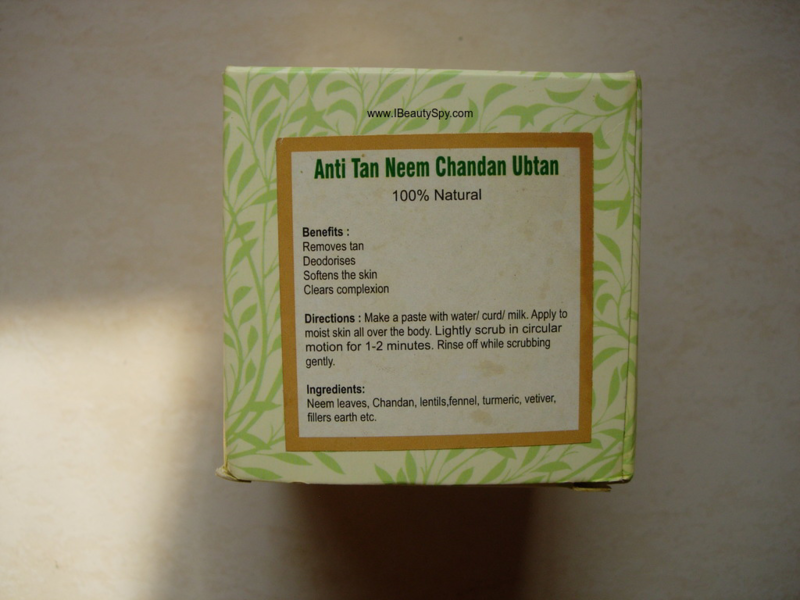 So when Matru Ayurveda sent me their Anti-Tan Neem Chandan Ubtan, I was really excited to try it out. Coming to the brand, Matru Ayurveda is an ayurvedic brand based in Bangalore and they offer a range of pure, natural products from ubtans, face packs, scrubs, soaps and a variety of cold-pressed oils. Read on to know more about the Matru Ayurveda Anti-Tan Neem Chandan Ubtan and whether it is effective in tan removal. 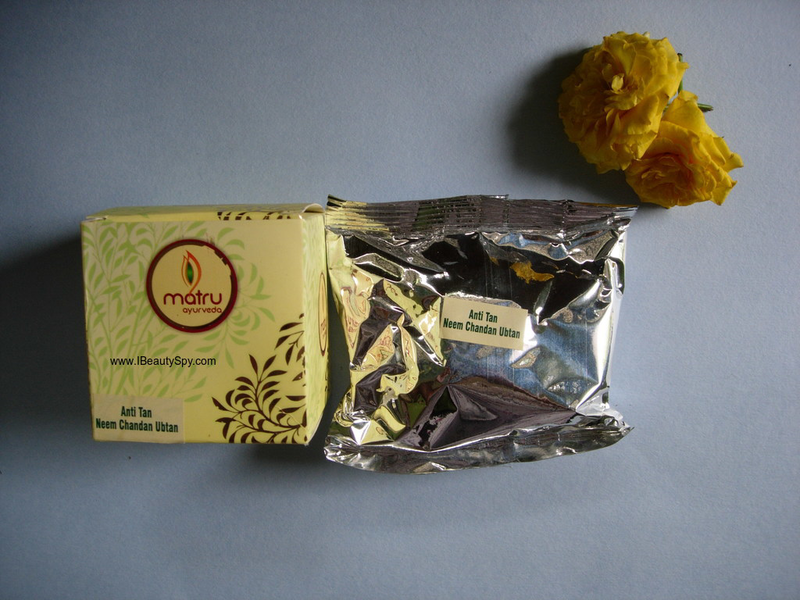 We at Matru Ayurveda offer products for health and beauty. Our Ayurvedic products tap into natures healing resources for bringing nourishing beauty care and health products. Made using natural ingredients, it helps clear the skin and lightens it by removing layers of accumulated tan. The different herbs when combined make it a strong anti ageing potion which when applied on the skin not only repairs it but prevents damage as well. The ubtan comes in a cardboard box with a simple pouch inside. Once I open it, I can keep the pouch inside the cardboard box to keep it air-tight. So in terms of packaging, its really good rather than just offering a pouch. 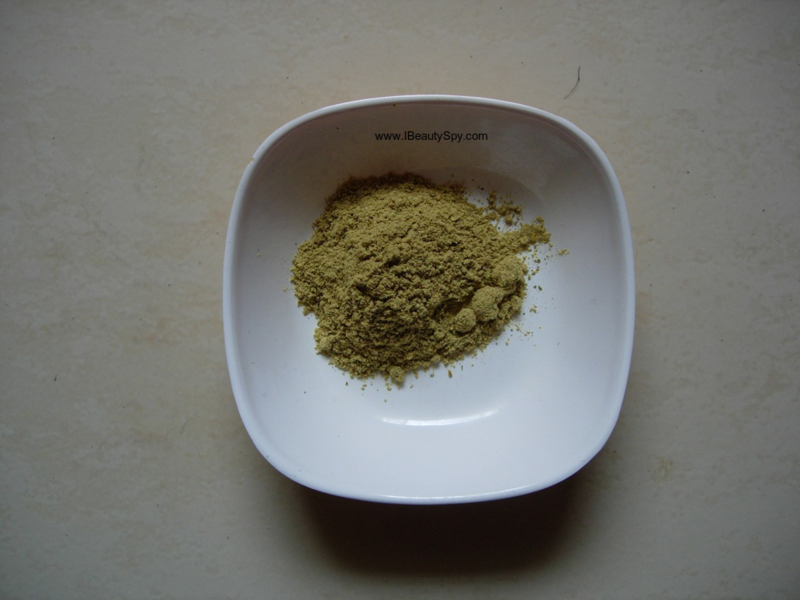 The ubtan is a yellow colored powder with a mild ayurvedic smell, mainly of neem. I find the fragrance very soothing and calming. I take about two spoons of the powder and mix it with curd. It forms a fine paste which is easy to spread and apply. I apply on my tanned areas, face, neck, arms and foot. I leave it on for around 20-30 minutes. I then wash if off by mildly scrubbing. The particles are tiny and perfect for scrubbing. Being a natural product, I thought I would need to use it for a long time before seeing results. But to my surprise, I could see most of my tan removed in first use itself. 😀 I was super impressed and continued using it daily. Within 5 uses, all my tan had been completely removed. I had some dark patches of tan on my arms for a long time. The ubtan was effective in getting rid of it too. So I can safely say it not only removes fresh tan but also long-term old tan. Apart from removing tan, it also brightened my skin and made it soft and smooth. So it also works as an exfoliator without drying out the skin. It also deep cleanses skin and clears away all dirt and impurities due to the presence of neem thus giving clear skin. While using on my face, I could also observe it reduced my acne and breakouts and calmed down my skin. The product is completely herbal and ayurvedic, so you can use it even everyday. My only con is that I wish it also came in bigger size, so we can use for entire body everyday. Does it satisfy its claims? Yes, it satisfies all it claims. * Removes tan effectively – both fresh tan and long-term old tan. * Results are quick. You can see visible results from first use itself. * Also acts as an exfoliator. * Makes skin clear, visibly lighter and brighter. * Doesn’t dry out skin. * Gentle enough for daily use. * Soothing and calming scent of neem and sandal. * 100% natural and herbal. * Wish it came in bigger pack of 300g or 500g so we can use everyday for entire body. Yes, definitely and definitely for everyone. Its little expensive if we use everyday. But since its a completely natural product with effective results, I think its worth the money. Maybe they can offer discounts for bigger packets. 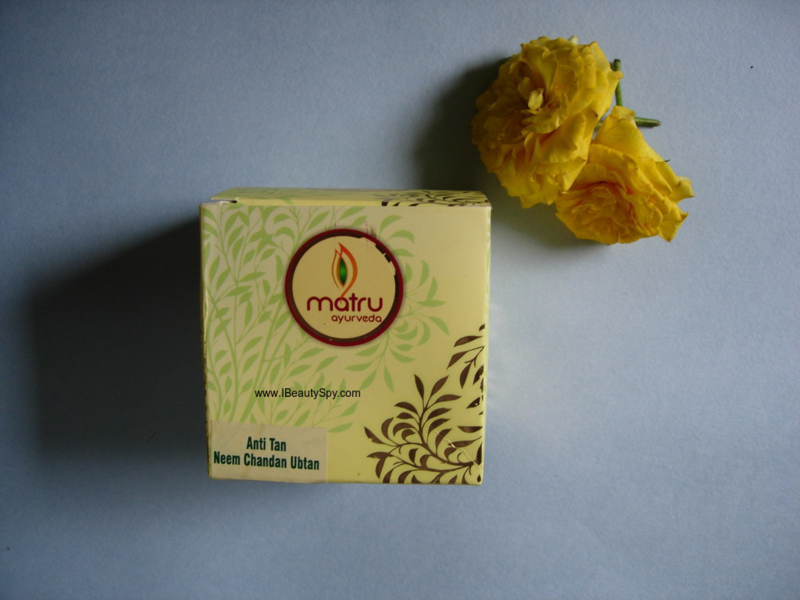 Matru Ayurveda Anti-Tan Neem Chandan Ubtan is really an excellent remedy for tan removal. If you are suffering from tan and dark patches, you should definitely give this a try. You can see your skin tone one shade lighter from first use itself. Also, being a ubtan, it can be used everyday for bathing instead of soap. 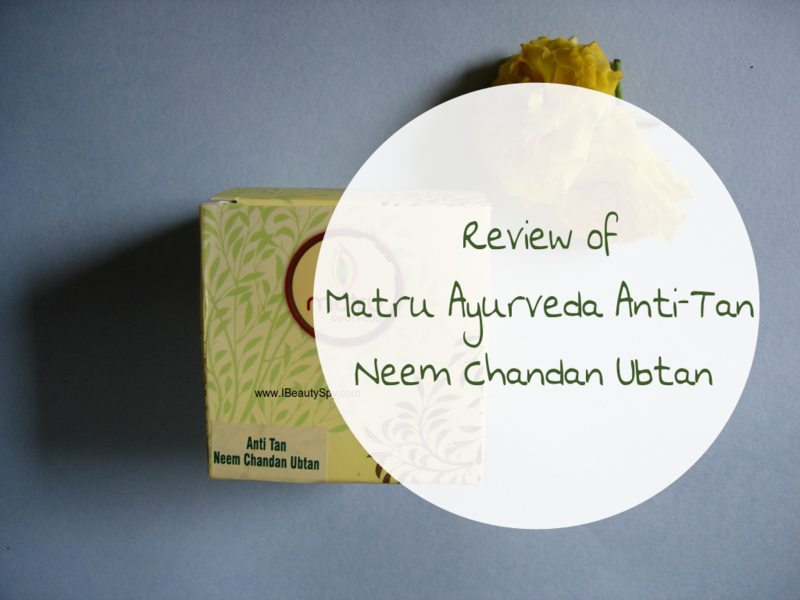 Have you tried Matru Ayurveda Anti-Tan Neem Chandan Ubtan? Which is your go-to product for tan removal? I have tried most of the Tan removal creams and also DIYs,.. but none worked as I expected. I will give a try to this too,.. Thank you for the review,..
That’s a brand I have heard of but yet to try their products.